This is not a soup you usually see on a menu in a Mexican restaurant in Orange County—not unless you are in a real Mexican cantina in Santa Ana where they’re not catering to us gringos. Those are the best to go to, for sure, but it’s not always convenient for us to go to Santa Ana. Actually, it’s hardly ever a destination for us, although maybe we should try harder, because those restaurants are definitely worth the drive! At the restaurants nearer us, there’s usually just tortilla soup and albondigas soup. 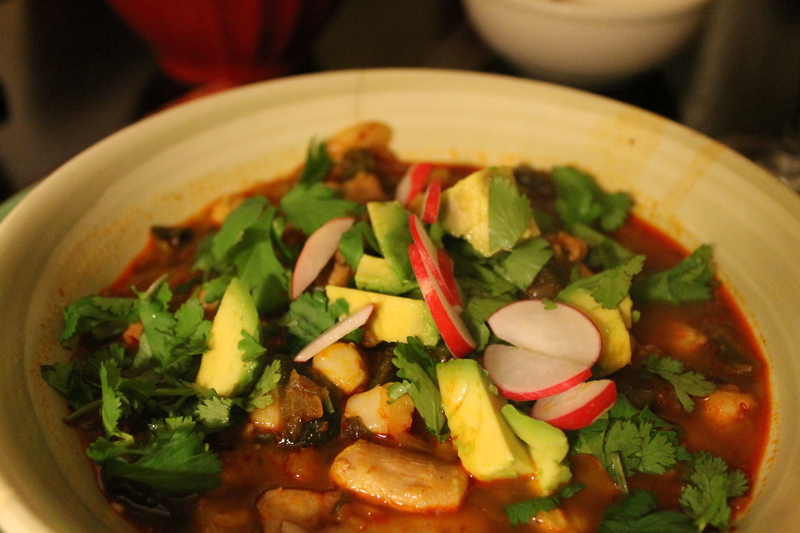 Speaking of tortilla soup, I’m going to have to share that recipe pretty soon too. Hmmmm…. 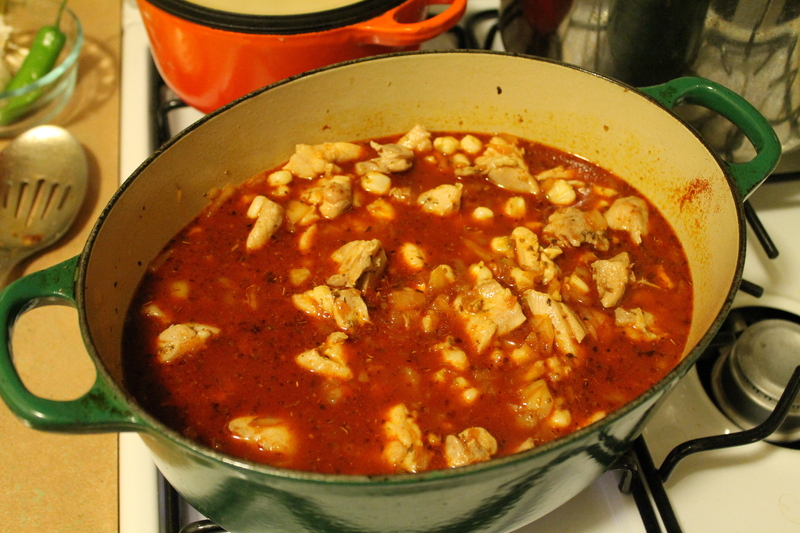 But posole is full of flavor as well as being a very filling soup. This one is touted as being a “quick” weeknight soup, and I definitely think it would be if you didn’t have to prep the pasilla chiles. The Husband caught me fibbing a bit when I said how long it would take to make; I said 40 minutes, which was a lie in the end. Sometimes it feels like a quickfire challenge in the Tiny Kitchen, trying to get dinner on the table in The Husband’s time frame—goodness, what’s it like with kids? 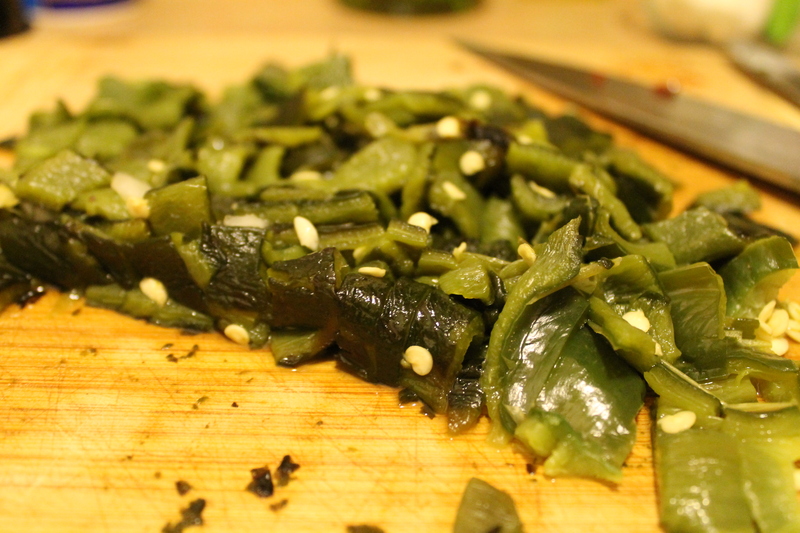 If you can prep the chiles the night before, this makes for a very easy meal to make after work. Perhaps if you have a kitchen big enough to have someone help you do the chiles while you’re doing the rest, it can be done in the same night. Don't worry if there's still a few seeds and/or skin on the pasillas. Nobody will notice, and they'll just add to the flavor. Big tip: Do not run the chiles under running water to remove the blackened skin. It’s easier to use a butter knife to scrape off the burnt bits and the seeds from the inside. If you run them under water, you’re rinsing off all of the flavor you roasted the chiles for in the first place! 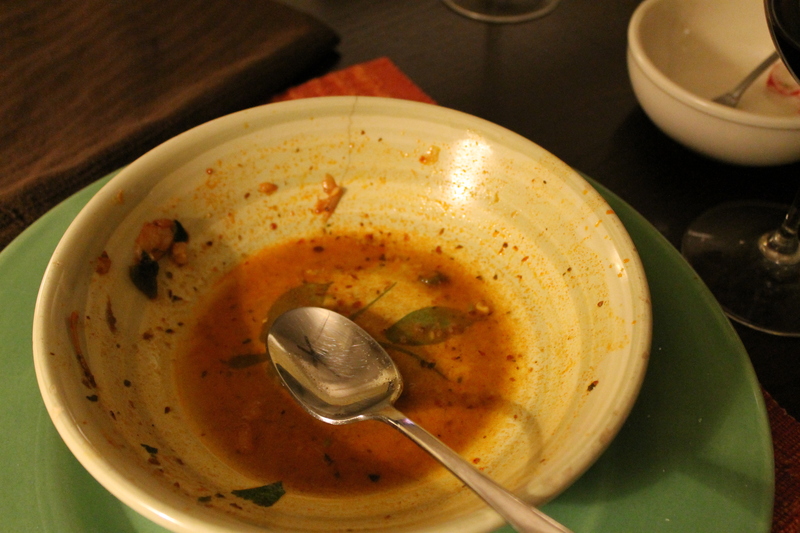 Also, we made this with homemade chicken stock this time, and it made a huge difference. It was a great way to use up some of the chicken stock I’d been making from the parts left over from my butterflying of our weekend chickens, and a very tasty way. We don’t usually serve this soup with anything other than chopped avocado, sliced radishes and fresh cilantro. You can add sour cream if you want, but that’s not our style. The Husband wants to add cotija cheese, and I’m sure it would work well. Vegetarians/vegans, I would suggest substituting the chicken for nice fat brown mushrooms. In fact, I’d love to try this soup with mushrooms instead. I think you’d get a similar texture and flavor, especially if you substituted the chicken stock for mushroom stock instead of regular vegetable stock. Preheat broiler or grill. When hot, broil pasillas on a baking sheet until blackened, turning as needed, about 15 minutes. Make sure they are nice and black before taking them away from the heat. Throw them in a plastic bag or wrap in plastic wrap for at least 5 minutes. This makes them easier to peel. Meanwhile, in a food processor (I use a mini one, which is the perfect size), whirl garlic to mince. Cut onion in chunks and pulse with garlic until chopped; set aside. Drain hominy; set aside. Reduce heat to medium-high. Add onion mixture and remaining 1 tsp. oregano to pan and sauté until onion is softened, 3 minutes. Meanwhile, in a microwave-safe bowl, microwave broth until steaming, about 3 minutes. Add ground chiles to pan and cook, stirring, about 30 seconds. Add broth, hominy, and chicken (mushrooms) to pan. Cover and bring to a boil, then reduce heat and simmer to blend flavors, about 10 minutes—or longer if you have the time. Remove stems, skins, and seeds from pasillas and discard. Remember DON’T rinse them under water! Use a butter knife and some paper towel to get rid of the skin bits. Chop pasillas into a dice. Stir pasillas into posole and cook at least 1 minute. Ladle into bowls; top with garnishes of radish, avocado, lime juice and cilantro. *If you’re in Southern California, both of these should be easy to find. Just go to your local grocery store and look in the Mexican section; there’s usually an endcap with Mexican chiles and spices. I usually get ancho chile powder or New Mexican chile powder when I can find it. Both work very well. If you’re not in Southern California, use Greek oregano and you might have to look online for some chile powder. You DO NOT want to substitute cayenne for the chile powder here! The soup will be too spicy to eat! This chile powder brings flavor to the soup, not a great deal of heat. 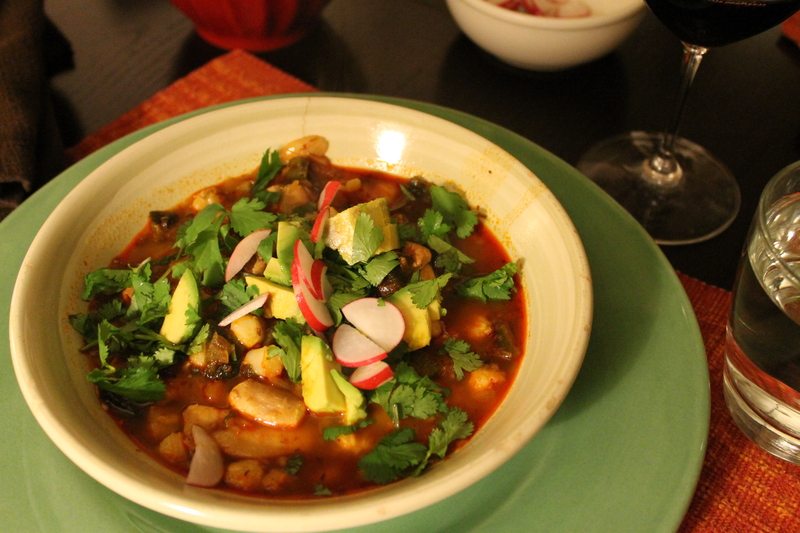 Love posole. I need a big vegan bowl of it tonight – I’m sure it would cure my cold!! I’m sure it would! Chile is a great healer. Absolutely! And ours too. Yet another thing in common!